2. Contrary to popular belief, absinthe doesn’t make you hallucinate. This is a popular absinthe myth and is 100% false. Of course, consuming any spirit (especially one with an extraordinarily high proof) in large quantities will have consequences. 3. The proof: 124. No wonder absinthe is so misunderstood, especially when compared with vodka or rum which is 80 proof. 4. Genuine absinthe should never be lit on fire. The traditional method of preparation involves dripping ice-cold water into a glass of absinthe. A sugar cube can also be placed on a slotted spoon between the absinthe and the dripping water to sweeten the drink. Lighting a cube on fire is not only dangerous but can ruin the wonderful flavor of authentic absinthe. 5. Clear absinthe “blanche” or “le bleu” is also an authentic style of absinthe, primarily produced in Switzerland, but differs in that it is a clear spirit and often has a slightly lower alcohol content. When produced authentically, both styles “louche” when cold water is added, and both styles use grande wormwood, green anise, and sweet fennel in their herbal formulations. Add absinthe, simple syrup and fill with crushed ice. Pour mixture into shaker and shake vigorously. 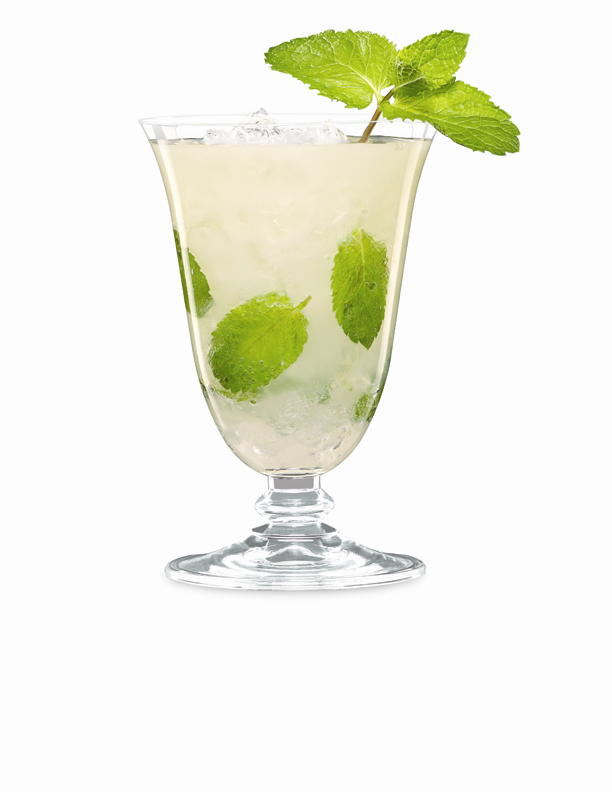 Pour contents into glass, top with splash of soda water and garnish with mint sprig. Muddle mint leaves in the bottom of a frappe style glass.